RIO GRANDE CITY — In an update of how Starr County is progressing that he delivers every two years, County Judge Eloy Vera had a major accomplishment to announce during Thursday’s state of the county address: the county had paid off its debt. Two years ago, when Vera stood in the same spot in the Julabe Event Center before members of the community, the county was still paying off lingering debt stemming from loans taken out due to dwindling funds. The situation was “disastrous,” Vera said. The county lost between half a billion to a billion dollars over a two-year period due to the drop in natural gas prices and decrease in revenues from the Roma International Bridge and the Starr County Detention Center he said. Fortunately, though, it was around that time that wind energy companies began moving in and now several wind farms have been constructed in the county. The arrival of those companies, as well as an increase in revenue from the detention center and the Roma bridge, allowed the county to pay off about $2.5 million in loans in January 2018. Despite having not having to worry about those loans, Vera clarified that the county still owe money for lease-purchase equipment for day-to-day operations and they owe money the city of Roma for the international bridge. Through a partnership with the city, the county owns 65 percent while the city owns 35 percent of the bridge. Because of unrest in Mexico, Vera under-projected revenues from the bridge resulting in the county paying the city less than they should have by the end of the year. This year, however, Vera said that instead of budgeting the revenues 65-35, he budgeted them 50-50 to ensure the city received their portion plus an additional 15 percent. Despite that, the county’s finances were in good standing, Vera said, and they were finally able to open a rainy-day fund that currently holds about $750,000. Throughout the county, other entities had also made large strides. The Starr County Memorial Hospital partnered with Doctors Hospital at Renaissance to provide more health services in the county and is also applying for $500,000 in grants in hopes of purchasing more ambulances. Also, through a collaboration between the University of Texas Rio Grande Valley School of Medicine and the county commissioners — specifically Commissioner Eloy Garza who provided facilities to the university free of charge — the county opened a free health clinic in La Victoria, an area just north of La Grulla. The clinic provides immunizations, physicals and other services free of charge. The judge said Starr was the “land of opportunity” for new businesses but also tourism to their historical landmarks. “The county commissioners court remains committed working with our municipalities to improve roads, drainage and also in offering incentive packages that help recruit and attract new prospects in business and industry,” he said. Future projects for the county included the completion of U.S. 83 between Roma and Zapata and the relief route around Roma and Rio Grande City which, despite being in discussions for 20 years, Vera hopeful will begin construction by the next state of the county address. 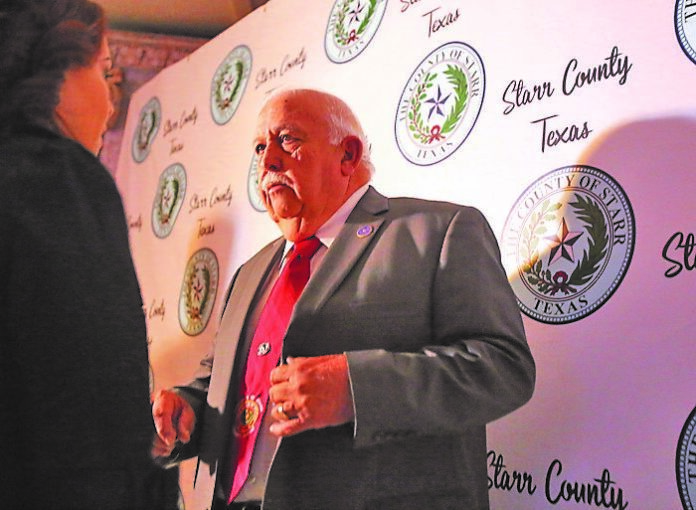 He also noted plans to refurbish the county courthouse and an upcoming commercial development project that the Starr County Industrial Foundation has been working on with Rio Grande City. As of today, the current unemployment rate is at 8 percent. Vera touted that the county was able to accomplish all that without raising taxes and said they were committed to lowering them.